A well kept secret awaits your visit! 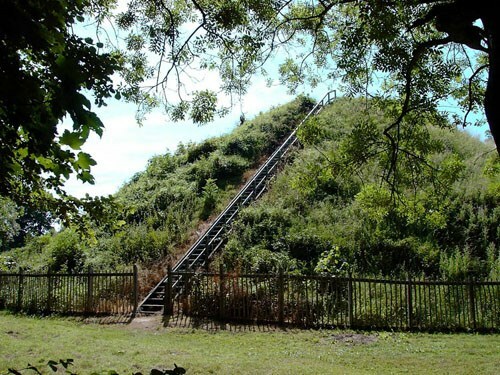 The largest barrow offers far reaching views from the summit. The largest of the four remaining Bartlow Hills is the largest barrow in Britain and very few people know of it. This Romano-British site at Bartlow is on the Essex-Cambridgeshire border. It was originally the largest group in Europe when there were seven enormous barrows here, however three were destroyed when a railway was laid through the site! The railway is long gone, however the four surviving barrows remain. One is on the far side of the former railway track and completely overgrown, the other three are nicely preserved and maintained. The largest survivor is 45 feet high and the highest in Britain by far. The wooden staircase gives access to the top without causing erosion. You can then look down on the other two giants. Some artefacts have been recovered and are now in Saffron Walden Museum (Bartlow was formerly in Essex). It seems incredible that this magnificent and enormous site is so little known. If Bartlow were in Wiltshire rather than Cambridgeshire there would be hundreds of visitors every day. Visit and be amazed! 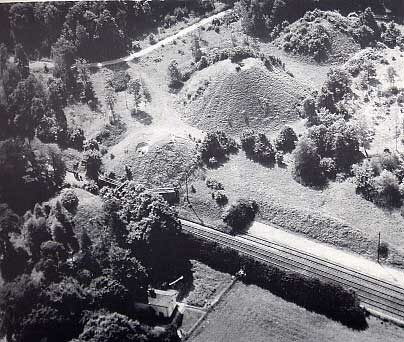 The fourth barrow now overgrown is clearly visible in this old photograph. Access to the barrows is via a footpath, but it is not well marked. At the crossroads for the hamlet, take the road southwards towards Ashdon. You will pass the remains of the bridge that carried the railway over the road, then there is a layby on the left for about 2 cars where you should tuck in well when you park. The footpath to the hills runs eastward at a tangent to the road. The cache dates back to December 2001 making it one of the oldest in Britain which is rather appropriate for the ancient setting. (Link back to original listing) However, it was sited in the Bartlow Estate at a time when cache placings were not reviewed as they are today. In the absence of the original owner we have therefore adopted it and relocated it onto public land. We hope that the appropriate siting and the association with the barrows will entice far more cachers to visit and virtually eliminate the high proportion of "did not find" reports that may well have contributed to the low number of cachers visiting. The cache lies very close to a second footpath which runs parallel to the road. You will encounter this footpath more or less as soon as you enter the path to the hills. GPSr reception under the trees is predictably poor so we would suggest getting yourself due west of the cache on the west side of the road, pacing your way north to the entrance by the hills footpath, then pacing your way back south on the parallel footpath. The land to the east belongs to Bartlow Estate and is private. The vehicular track that bisects the two footpaths is not a public right of way. After finding the cache treat yourself to lunch and a pint of good beer at "The Three Hills" pub in the hamlet and then visit the church, which is particularly quaint and has an interesting round tower.